For a long time, I thought I saw him before I knew I saw him. Just before going to bed each night I would look out through the front window – the nightly ritual. How many species of creatures might be nibbling up the last remnants of food left earlier on the porch for the stray cats? It seemed silly but I loved this late night thrill of expectation. Then one night there was an unfamiliar gray/white long-hair creature. Was it a cat? Before I could focus my eyes the creature made a dash into the dark. This went on for months. I never saw The Blur during the day and no matter how quiet I was while tip-toeing up to the window, The Blur would hear and off it went into the dark. One night I was visiting my friend Christina across the street. When I left her house I froze about ten feet from her front door. A miracle had revealed itself. On my porch across the street I saw The Blur eating away. He didn’t seem to register noise across the street. I was immobilized and fascinated. The Blur was definitely a cat! Where had he come from? How long had he (or she?) been eating on my porch? I crept closer and closer and The Blur still hadn’t fled. When I was in the middle of the street The Blur’s head snapped up, looked right at me, and was gone. In slow incremental bits of effort over many months another miracle happened. The Blur would actually stay nearby as I put out some wet cat food just for him. I’d see his eyes glowing in the dark. In time, I’d move from the food, go inside, but stop just on the other side of the glass storm door. And wait. And wait. The glowing eyes in the dark would inch by slow inch make their way towards the porch. My heart would be pounding. Then The Blur would pause for a long time just staring at the food. And at me. But he was visible. One day he put a paw on the porch step – my breathing instantly stopped – and then another paw, before hopping onto to the porch. I dared not blink even. He paused, stared at me, then at the small plate of food, and then inched in slow motion toward the plate. He devoured the wet, tasty treat all the while making quick glances to see if I was still there. The Blur obviously required a new name, and White Paws it became. He was mostly a gray/white longhair but his paws were white. Or sorta white. He looked dirty, unkempt, and totally feral. One night, rather than going behind the protective glass storm door, I only backed away from the plate of food and knelt down. White Paws inched from the cover of night and to the porch steps. Then he stared at me. And stared, and stared. I made not a move. Apparently he decided that food was more alluring than the danger of my presence and he came onto the porch and slow-motioned to the plate, eyeing me the whole time. I remained motionless except for a great smile stretched across my face. My heart was pounding, too, but I don’t think that White Paws could detect this. A week later I repeated this now familiar effort except I didn’t back away from the plate of food. I did kneel though. 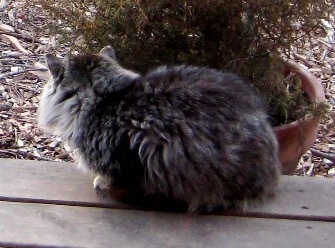 As if on cue, White Paws came into view, made his way to the porch step, and waited for me to back away. I didn’t. White Paws kept looking between the food and me. You could tell that he really wanted that food. If the price was my presence at the dinner table, so be it apparently, and White Paws, with great trepidation, inched his way to the plate. About a foot away he stopped, crouched, and stared at me. Or perhaps glared at me. I was frozen except I said: “It’s OK. It’s OK,” over and over in my very best calm voice. Then slowly, almost imperceptibly, he crept towards the plate. And began to hungrily eat. “Its’ OK. It’s OK.” When he finished he bolted. I felt a tremendous sense of victory and wondered if this is what it was like to, say, win an Academy Award? Surely the experience was identical? I would never have predicted when first seeing The Blur that I’d be able to actually pet him but in a surprisingly short time after White Paws joined me for a late dinner this assumption was proved incorrect. After a week of just squatting next to the food plate while White Paws ate I slowly extended my hand out and very gently brushed his neck. He instantly stopped eating. I pulled my hand away. He did not look up. He did not run. I resumed a gentle brushing. He didn’t seem to notice so I kept brushing. My heart was racing. When White Paws finished eating (or, rather, devouring), he looked at me, and bolted. Well, a beginning had been made. I thought about the many Star Trek episodes regarding the dangers of First Contact and was relieved that our introduction did not erupt into an interstellar conflagration. So began my daily brushing of White Paws. Then one day, after he finished eating, he startled me by simply laying down on his side with a thump. I brushed his side. He rolled onto his back. Now my heart really did stop. This was an astonishing, extraordinary act on his part. He had made himself wholly vulnerable. I petted and brushed his belly. He curled up and flexed his paws in pleasure. I couldn’t believe it. Nope, this was no feral cat. This had once been a pet. A beloved pet. What, I could only wonder, had happened to bring about such a drastic reduction in his lifestyle? How long had he been abandoned? How did he find me? Or was he dumped into my neighborhood? These were all questions I knew would never be answered. From that day on you would have thought that White Paws had been born in my hands. He proved incredibly loving. He adored Christina even more and flirted with her outrageously. He took to following her whenever she was outside and would brush up against her legs. If she indicated even the slightest attention towards White Paws he’d throw himself on his back to fully reveal his warm, fur-covered belly. This addition to the not-mine cat population came with downsides. White Paws was clearly not well; he had massively enlarged lymph glands and was never clean (a sick cat stops cleaning itself). I assumed feline AIDS or leukemia. Or maybe just cat cooties. Or all three. His long fur helped disguise how sick he was but on occasion – fool that I am – I took to giving him a bath and was always shocked by how scarily skinny he proved while wet. After drying him off though he took obvious pleasure in being clean and looking so much more presentable to all decent society. In time, he learned to take baths with a sorta kinda somewhat calm resignation. White Paws was also a pisser. A world-class pisser. He sprayed all the time and on all things. I once took bags of groceries from the car, put them on the driveway, and went to the other side of the car to get the rest. When I picked up the first bags, White Paws had gotten to them. I hadn’t even seen him. My car tires were always marked, so, too, was my glass screen door, the bottom twelve inches of my entire house, everything inside the garage, and every clay pot in the garden. From a certain perspective (not mine, I assure you) it was all rather impressive. Here was a cat who REALLY wanted to mark his territory. I pretty sure cats in the neighboring three counties even knew: White Paws was here. You would think that this odorous, exceedingly unattractive habit of the boy would have made me run him off but I couldn’t help but feel I had given refuge to a very scared and very sick creature. In time he even plumped up, and the occasional bath assured his looking spiffy. It was also hard not to take joy in his absolute joy over being petted and fondled and having his tail pulled. So, I did get a lot of selfish pleasure in having White Paws around. The price was pee. Would White Paws make it through the winter? He was so terribly skinny and so obviously unhealthy; I just assumed bitter cold would kill him off. Of course, this would resolve the problem of his Olympian-class spraying but I had grown fond of the rascal. I also knew that dirty fur was much less able to insulate than clean fur, and White Paws, no matter his occasional bath, was normally a dirty cat. The trick, therefore, was one of timing. I had to get him clean before it grew bitter cold but not too much before. With any other cat I could bath, fluff with a towel, and keep them inside until they were fully dry. This was not possible with White Paws though. As soon as he was toweled, outside he was ushered. STAT. To leave him inside for even five minutes would mean that my half my kitchen would be, ah, scented. You see, timing. I had to get him clean just before the bitter cold set in but while it was still warm enough that I could scoot his still-damp self outside without assuring pneumonia. This proved just one of two problems. The second concern was my conviction that he just wouldn’t make through a winter no matter how downy clean. A solution was offered by happenstance. For several years I had kept a heated water bowl in the front yard during the winter. The many creatures, including birds, seemed deeply grateful for this shimmering pool of liquid refreshment in an otherwise frozen, ice-covered world. Then one night, just before I went to bed, I did my standard peek out the window to see that all was well on the front porch and yard. Just as I started to turn away a curious sight captured my attention. The heated water bowl was not full of the expected shimmering H2O but rather grayish fur. I put some shoes and a jacket on, crept outside, and soon realized the answer to the curious sight: White Paws was curled inside the obviously dry but still heated bowl. He was deeply asleep and even my footsteps had not waken the boy. As I stood pondering this unexpected situation a huge smile crossed my face and a joyous feeling filled my chest. The next day I purchased another heated water bowl and hooked it up inside the garage. It should be noted however that the garage was unlike most garages. When people think garage they envision a neat structure akin to something that Ward Cleaver might have had. My garage though was more Ma and Pa Kettle. It was entirely built from salvaged materials and there was a precarious lean – a sort of low-rise, wooden Tower of Pisa. There were two huge doors on side hinges and which, because of the lean, did not even remotely close tight when shut. The walls were 12-inch wide vertical boards and each had a space between them through which wind could howl through, and did. The roof however, God bless it, kept the rain away. Mostly. These structural issues notwithstanding the garage seemed better than my front yard as a place to offer some protection for White Paws. I took several old doors stored inside the garage and arranged them in a U-shape. This, I figured, would create an oasis against the prevailing north wind. Inside the U, I placed the heated water bowl. My truly brilliant (Ok, truly crazy) idea was to suspend a heat lamp over the bowl for additional warming radiations. Thus outfitted, I nonetheless grew worried. Would White Paws even find this heavenly spa? If so, would he use it? I had never known him to use the garage except as target practice. That first night, just before I went to bed, I tip-toed into the yard. A fierce snowstorm was raging, the ground was covered with a thick, virginal blanket of snow, the wind howled, denuded trees shook ominously overhead, and the temperature was teeth chattering. I pressed my face against a small window on the side of the garage. About six feet away, and under the glowing circle of light from the heat lamp, lay the water bowl – filled with gray fur in a tight ball. My heart erupted into song. A smile stretched wide and nearly cracked my cold face. At that moment, I experienced a level of elation so great that one would have thought I had just ushered in world peace rather than merely create some comfort for a sick cat on a cold night. But spectacularly elated I was. I tip-toed back to the house across the brilliant white landscape, utterly suffused with happiness. There may be, I knew, terrible things happening across the globe, but in rural Kansas, on that night, and in a leaning, derelict garage, was one happy – and warm – creature of God. I am pleased to announce that White Paws survived that winter. Each night, my final ritual was tip-toeing out to the garage window. This effort was always rewarded with the sight of a tightly curled ball of gray fur. Occasionally, White Paws would hear me and his head would jerk up in my direction. I would wave my cold fingers, and he would stare a few moments, then shove his head back into the curl of himself and the warmth of the bowl. As I tip-toed back my heart always felt brilliantly joyous. Could it be possible that there was a better way to end a day? I suspect not. On occasion my nightly ritual was met with some unexpected surprises. During a particularly bitter night I peered through the window and another cat was snug against the outside of the bowl, asleep, as was White Paws inside the bowl. It had not occurred to me that the outside of the bowl would also radiate warmth. Because snow could, and did, drift into the garage on windy days, the whole would be covered by a blanket of white. Except for a bare circle around the bowl, a dividend of the heat lamp. So, between the lamp and the bowl, the oasis of warmth extended to about a foot away from the bowl in a perfect circle. One night White Paws was kept company by another cat and two small opossums. You can image my feeling of joy on that occasion. Not once did I peer into the window to find the bowl empty of White Paws, although during the day when I sighted him on his daily walkabout I would sometimes run back to the garage, peer in, and invariably find another cat in the bowl. Never once though did I see another cat in the bowl and White Paws outside the bowl. The boy was nothing if not highly, successfully territorial. During the day when White Paws was in his warm oasis I would enter the garage, kneel down, and run my hands along his furry body. Damn, he was hot! It was a surreal experience that, amidst bitter cold and icy conditions, he would be hot to the touch, like a pizza just out of the oven. He would roll inside the bowl and expose his belly which I dutifully rubbed to his immense pleasure. He would then rev up the purrmeter and his toes would curl from pleasure. I think my toes curled as well. Every day that I saw White Paws I was slightly surprised. He survived another day, I would think. I still had no idea what was wrong with him but his hugely bloated lymph nodes were an unmistakable indicator that his body was mightily working 24/7 to stave off the lethal results of God knows what. Then his precarious health dive-bombed. One summer afternoon he was curled up on a warm slab of concrete, in the full sun, and I gave him tender pats. He did not react much, and seemed half-gone. And he smelled funny. Oh, this is it, I thought. I did not see him the next day. Nor the day after that. Nor for the week following. I knew he really must be gone because the tell-tale signs of the boy, you know, were fading away. My sadness was greater than expected. Several months passed and I was mowing the lawn. A cat wandered onto the edge of the lawn and I absentmindedly thought: Gee. That looks just like White Paws. I continued mowing. A few minutes went by and I though: Huh? Is that White Paws? I stopped the mower, turned, and looked at the gray cat at the edge of the lawn. “White Paws?” I called out. The cat immediately started to walk over to me. The cat came right up to me, and tharrumphed down on his side, exposing his white belly – an unmistakable White Paws greeting. “White Paws!” I was stunned. Where had he been for several months? How had he been eating? What had he been eating? He looked perfectly fine, albeit very dirty. “White Paws!” The long tail curled with pleasure, and I bent down to pet the filthy, happy, still-alive creature. To this day I have no explanation for his sojourn, although have known this to happen before. Do very sick animals somehow board a special train unseen by humans, like the one in the Harry Potter novels on track 3-3/4, and travel to a magical healing hospital high up in some unknown mountain perpetually surrounded by mist? Well, what other explanation could there be? In any event, I was glad that the Mighty Pisser, sigh, was back. My only image of White Paws. You are such an endearing person, Ross, and you help us spot love and beauty everywhere. Reading your blog is one of the joys of the day. Thank you. Thank you for the lovely bedtime story, Ross! Your “cat tales” make my heart sing. Your beautiful story of love and persistence, by both you and White Paws, gave me tears. Hopefully The Pisser Elite is only on the 3rd or 4th of his 9 lives. Love reading my daily Ross-fix! What a loving entry. Thank you for sharing. *Heart* White Paws. A cat story worth of James Herriot! I didn’t realize about this other blog but I have added it to my list so I don’t miss anything!